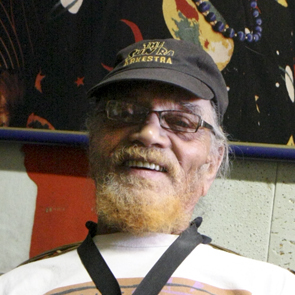 Nick visits Sun Ra's band mate Marshall Allen in the Philadelphia row home that once housed Sun Ra's Arkestra. Allen talks about memories of Sun Ra and life in the artists' cooperative. Honoring the late Civil Rights leader with two hours of songs and stories in his spirit from inspiring leaders in music past and present. Harry Belafonte--a confidant of MLK-- recalls his career in music and social activism, including the "Anthology of African-American Music." Plus tales of one of jazz's great eccentrics - Sun Ra - remembered by band members Marshall Allen and Michael Ray, and biographer John Szwed. Honoring the late Civil Rights leader with two hours of songs and stories in his spirit from inspiring leaders in music past and present. Harry Belafonte--a confidant of MLK-- recalls his career in music and social activism, including the recently available "Anthology of African-American Music." Plus tales of one of jazz's great eccentrics -- Sun Ra -- remembered by band members Marshall Allen and Michael Ray, and biographer John Szwed.